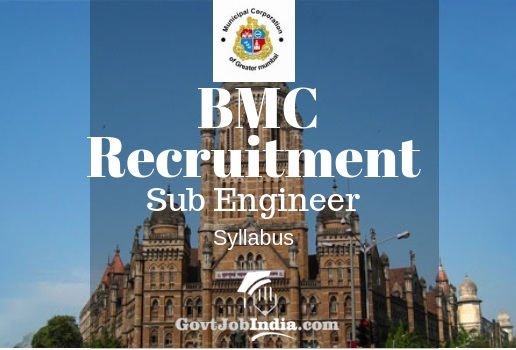 बृहन्मुंबई महानगर पालिका BMC Sub Engineer Syllabus 2018 Group B – All the candidates who are looking for the BMC Sub Engineer Syllabus and Exam Pattern are thus notified that the MCGM Sub Engineer Exam Pattern has been elaborated in the following sections. All the information given in this article has been borrowed from the Official Portal where the Brihanmumbai Municipal Corporation/Municipal Corporation of Greater Mumbai has given the official BMC Sub Engineer Syllabus PDF. This can be verified by going to the official BMC Website which is mcgm.gov.in. 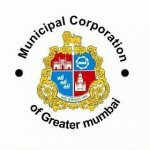 The last date to apply online for the Municipal Corporation of Greater Mumbai (MCGM) Recruitment has extended to the 31st December 2018. Since the MCGM/BMC has only come out with the Syllabus and Exam Pattern of the Technical portion, we would advise the candidates to start preparing for this at least. As soon as the authorities release the Syllabus for the other subjects, we will update out website. Till then, we would advise the candidates to download this BMC Sub Engineer Portion 2018 onto their personal computer and start preparing! Building Construction & Materials: Properties of wet and hardened concrete, tests on concrete, factors affecting strength of concrete, water-cement ratio, aggregate cement ratio, mix design, additives, design of form work, types of formwork. Stones, bricks, cements, lime, mortar, timber, plastic, concrete, steel, paints and varnishes. Principles of building planning and design, integrated approach, building byelaws, building services such as vertical transportation, water supply sanitation, thermal ventilation, lighting, acoustics, fire protection, electrical fittings. Foundations, stones, brick and block masonry, steel and reinforced cement concrete structures, floors, doors and windows, roofs, finishing works, water proofing. Strength of materials: stresses, strains, principal stresses, bending moments, shear forces and torsion theory, bending theory of beam, deflection of beam, theories of buckling of columns. Theory of structures: Analysis of beams, frames and trusses, slope deflection method, moment distribution method. Steel structures: Design of bolted and welded connections, columns, footings, trusses, steel beams, plate girders. Design of reinforced concrete structures (Working stress and limit state): Design of slab, beam, columns, footing, retaining walls, tanks, building frames, staircases. Construction planning and Management: Elements of scientific management, elements of material management, safety engineering, network analysis, construction equipment, site layout, quality control. Surveying: Classification of surveys, measurement of distances-direct and indirect methods, optical and eletronic devices, prismatic compass, local attraction; plane table surveying, levelling, calculations of volumes, contours, theodolite, theodolite traversing, omitted measurements, trigonometric levelling, tacheometry, curves, photogrammetry, geodetic surveying, hydrographic surveying. Estimating, costing and Valuation: Specification, estimation, costing, tenders and contracts, rate analysis, valuation. Geo-technical Engineering: Geotechnical properties, stresses in soil, shear resistance, compaction, consolidation and earth pressure, stability of slopes, bearing capacity, settlements, shallow and deep foundations, cofferdams, ground water control. Highway Engineering: Planning of highway systems, alignment and geometric design, horizontal and vertical curves, grade separation, materials and different surfaces and maintenance, rigid and flexible pavement, traffic engineering. Bridge Engineering: Selection of site, types of bridges, discharge, waterway, spans, afflux, scour, standards, specifications, loads and forces, erection of superstructure, strengthening. Water Supply Engineering: Sources of supply, design of intakes, estimation of demand, water quality standards, primary and secondary treatment, maintenance of treatment units, conveyance and distribution of treated water, rural water supply. Waste water Engineering & Pollution control: Quantity, collection and conveyance and quality, disposal, design of sewer and sewerage systems, pumping, characteristics of sewage and its treatment, rural sanitation, sources and affects of air and noise pollution, monitoring, standards. c. Solid Waste Management: Sources, classification, collection and disposal. Basics of Mechanical Engineering – Concept of mechanical technology – Milling, planning, shaping, drilling, reaming, grinding, riveting, welding and joining process – types, defects. Super finishing processes – Honing, lapping, buffing Casting, forging, rolling, drawing, forming processes Classification, Selection and application of Machine Tools, Cutting tool material. Coolants, Design of cutting tools or Tool design. Theory of Machines – Belt Drives, Gear Drives, Joints and Coupling, single and multi cylinder engines and v engines, belt and chain drives, degree of freedom. Machine Design Concepts – Torson, Spring, Joints, Bearing – types and Design, Theory of Failure, Factor of Safety, Combined stresses, struts and columns, design of screw and bolts, Design of Shafts and Springs, Keys. Fluid Mechanics – Pumps, Types, Selection, Efficiency, Characteristics etc., Compressible fluid flow, Fluid properties, pressure, Thrust, Buoyancy, Viscosity, Bernoulli’s theorem, Hydraulic jump, non-uniform flow, reynold’s number, hydraulic gradient, water hammer. Manufacturing planning and Control – Manufacturing planning and control system, Forecasting, Planning Function, Planning for Material Requirements, Scheduling and sequencing, project management, Advance concepts of Production Planning 1 and 2. Refrigeration and Air Conditioning – Thermal Engineering – Ton of refrigeration, concept of latent heat, evaporation concept Thermodynamics – Law of thermodynamics, various Cycles w.r.t. PH curves Design of Refrigeration system – Compressor, Expansion unit, Accumulator, Evaporator, Condenser, Duct design, Vapour Absorption and Compression Refrigeration system Design of Air Conditioning system – Temp. Vs Humidity (8 different concepts), Types of system- split, centralised. Latest refrigeration and their examples. Parts of Vehicles – Engine, Chassis, Transmission, drive assembly, alternator, axle, body, wheels, brakes, steering, suspension etc. Efficiency – Thermal, Volumetric, Mechanical, Electrical system etc. 15. Electrical Fundamentals – Supply voltage, AC and DC Supply, voltage, current, inductance, resistance, capacitance, 3 phase and 1 phase supply system, electrical power, electrical energy, hv/ Iv supply, active and reactive power transfer and distribution, Reactive power consumption. Electrical power transmission & distribution – Substation & receiving station, earthling, substation equipment, Bus Bar, CT, PT, Protection relay numerical/ digital, circuit breaker, onload isolator, offload isolator, Surge arrestor, system grounding, equipment grounding, lightening protection etc. IS 3043, Single line diagram, control circuit, ladder diagram (PLC). Insulating material – Classification, dielectric strength, test & section (Bakelite, FRP, Teflon, PVC, HDPE, Mica, SF6, Vacuum, Oil etc). Electric Motors (Induction Motors) – Principle of working, 3 phase, 1 phase motors, motor starting methods, selection rating, cooling and enclosures, HV/LV motors, Motor protection relay, Motor control circuits, IS325, speed control methods-V/F control, slip recovery scheme, pole changing, construction of induction motors and their applications for pump, compressor, crane, actuator, tools, Maintenance & testing. Cables and wires – Types, construction, HV/LV cables, testing, fault finding, cable rating and selection, cable jointing, termination. Statutory requirement of electric installation – Oil, filtration, die electrical testing, insulation resistance testing, compliances with electrical inspector, safety precautions, permit to work (Lock out) procedure, safety equipment and test instrument, Indian Electricity Rules 1956 – provisions, IEEE, IEC, ESSA. Illumination (Light) – Types of light, solar lighting, LED, CLF, HPSV,Mercury lamp, tube light etc. Principles of Digital Instruments – Working principles of digital Voltmeter, Ammeter, Frequency meter, multimeters, Measurement of Resistance Megger Earth Test Potentiometer. Power Electronics – SCR MOSFET, FET devices, rectifiers and invertor, SMPS, PWM convertor, application. Batteries and UPS, DG sets. Electrical protection – MCCB, ELCB etc. Provision of National Building Codes on Building services & ventilation, electrical & allied installation, air conditioning, ventilation, acoustic, sound insulation and noise control, installation of lifts and escalators. Concepts of Electronics – Diode, Triode, Semiconductor, Forward bias, Reverse bias, Transistor – NPN, PNP. Logic Gates, De’Morgans Theorem, Boolean Logic. PLC concepts – Ladder logic, Programming, architecture 33 SCADA – Concept, Hardware, Software etc. Network Design – Lan, MAN, WAN, Topology – Ring, Star, Bus. 2. Development Plan (D.P.) Surveys, types, duration etc. Implementation and Financial Aspects. 7. Acts and Rules MR and TP Act 1996 Restated with D. Plan & Builds Design LA Act. 1894 Environment Act Related with Building planning. The Study Material given below contains the technical syllabus of the BMC Exam Syllabus for Civil Engineering. It also contains the MCGM Sub Engineer mechanical Syllabus along with BMC Recruitment Exam Paper Pattern for Electrical engineering as well as architecture. Furthermore, we have also given the BMC Syllabus 2018 PDF for the post of Sub Engineer, so that you can access the syllabus even when you are offline. All the necessary details concerning the MCGM Syllabus and Exam Pattern are enumerated down below which will help you know all the information regarding the BMC Sub Engineer Exam. The BMC Sub Engineer Recruitment Portion presented below will guide you through the process of preparing for the BMC Exam 2019, so that you will not be in need of any other MCGM Sub Engineer Study Material. The BMC Recruitment for the post of 291 Sub Engineer vacancies saw a huge amount of applicants from not just across the state, but also across the country. This was a very prized vacancy which candidates from all across the nation were interested in. The application process of the recruitment is still on, so if you haven’t applied online for it, make sure to apply by going to the BMC Sub Engineer Recruitment Page. So, without further ado, enlisted here are the BMC Sub Engineer Recruitment details which will be followed by the MCGM Sub Engineer Syllabus and Exam paper pattern. Did you find this article about BMC Sub Engineer Syllabus and Exam pattern useful? If you would require this page to prepare for the exam, then make sure to bookmark this page onto your daily browser and you will never be able to lose us. If you have a problem with coming online frequently, you should download the MCGM Sub Engineer Syllabus PDF which will help you study even when you are offline. So, in the end, we would just ask you to subscribe to our website if you think our content might benefit you. Do not forget the name, it is GovtJobIndia.com.